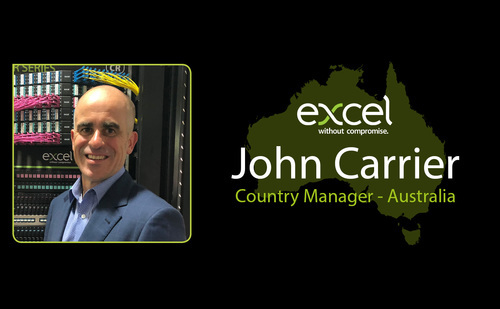 Excel is excited to announce the appointment of a new Country Manager for Australia, John Carrier. Excel Networking Solutions, the copper and optical fibre cabling infrastructure provider, has seen great success with their international growth and worldwide expansion in the 21 years since the brand’s inception. In light of this, Excel is excited to announce the appointment of a new Country Manager for Australia, John Carrier. During the past 25 years, John has developed extensive skills and experience in ICT & SCS servicing a wide range of industries throughout Asia Pacific. His strategic planning and implementation ability have made him successful leading sales, customer service, project and product management teams. At Molex John was the Regional Sales Manager responsible for the management of Sales, Customer Service & Product Management Teams for the India Pacific Region, whilst actively participating as a member of the Molex Premise Networks (MPN) Sales Management Design Team and the Global Copper Development Team. John’s extensive experience within the Structured Cabling Industry has come via working for Structured Cabling System Manufacturers & Systems Integrators where he has built teams, developed business and grown market share for each of the organisations he has worked for. As a Systems Integrator John has served as a Project Director, Estimator & Project Manager where he as delivered a wide range of Structured Cabling Solutions & specialist electrical systems. It is this experience within the industry and his confidence in working in the Australia market that will be pivotal to Excel’s success in this territory. For more information about Excel, please contact the team on 0121 326 7557 or email sales@excel-networking.com. Alternatively, please visit www.excel-networking.com.